Whilst recovering from minor surgery earlier this week I found my anaesthetic-clouded mind pondering over two unrelated yet inextricably entwined events… Two weeks ago, I handed in my final essay of the term before striding down The Strand to visit the National Portrait Gallery’s Taylor Wessing Photographic Portrait Prize. My essay was an analysis of post-colonial theory in relation to Sonia Boyce, a British born multi-media artist of Afro-Caribbean descent. I had spent innumerable hours totally immersed in the decades-long struggle for recognition experienced by Boyce and other members of the Caribbean Arts Movement and the Black British Arts Movement. 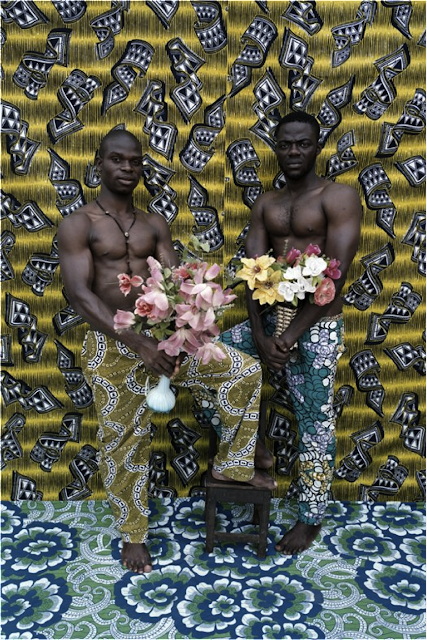 So, how was it that I had mutely accepted the presence of West African born Leonce Raphael Agbodjelou’s Untitled c-print photograph, from the Musclemen series, on display in the NPG? Who was he? How had Agbodjelou’s art found its way to London? What else was I missing? In 2010, during a trip up the River Niger to Timbuktu, Mali, the Australian expatriate Jack Bell first encountered sub-Saharan African art through the photographs of Hamidou Maiga. Attracted to the dynamic explosion of urban development across West Africa, as reflected in the art of a younger generation, this region quickly became the young Gallery owner’s focus. Bell’s next trip was to Porto-Novo, Benin, a former French colony. He was in search of the locally renowned Agbodjelou family - known to have been practicing studio photography for generations. Just look at the plastic flowers and brightly coloured backdrop of locally-printed Dutch-imported textiles that create an uneasy, claustrophobically charged atmosphere around the tense physical strength radiating from the two bodybuilders. Leonce Raphael Agbodjelou’s photographs are at once overtly contemporary yet steeped in cultural traditions. He reflects that the Republic of Benin has a “complicated past with slavery, colonialism, voodoo, and missionaries”, visually epitomized in the yellow and blue textiles. First popular in the 19th century, these fabrics were designed on the Indonesian batik, weaved in Manchester and printed in Holland before being transported to Africa. Does Agbodjelou intentionally highlight the Orient as a Western invention rather than an inert truth of nature? For explicitly socially and politically charged photography one needs to look no further than Bell’s exhibition Filipe Branquinho: Showtime. 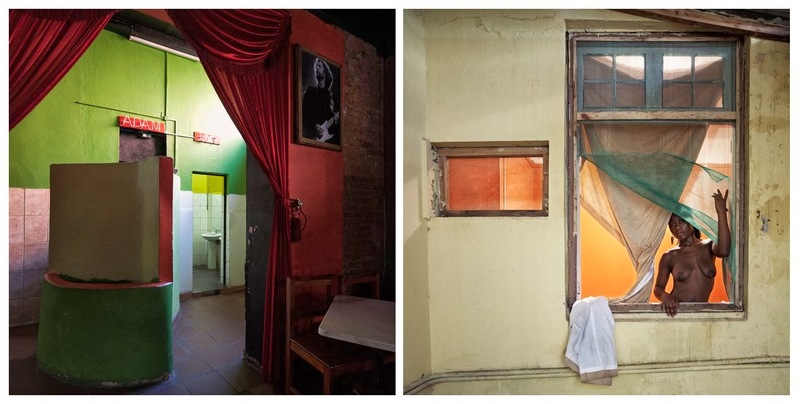 Using a diptych format for this series shot in his hometown Maputo, Mozambique, Branquinho pairs the dilapidated interiors of once successful colonial hotels with uninhibited portraits of local prostitutes. Rooms are available for rent. On the left hand side of the above image one can make out few remaining room keys hanging from hooks. Customers are received both day and night. On the right a woman is illuminated in an almost saintly manner. Bell reflects that the show has “provoked some fiery responses”. Occasional hiccups do happen. Such as when Bell set about to exhibit sculptures by the Mozambique based artist Goncalo Mabunda. Made from a plethora of weapons recovered in 1992, such as AK-47s, rocket launchers and pistols, Bell received a call from customs questioning why 600kg of arms had arrived in the UK addressed to him. Earlier this year Somerset House hosted 1:54, London's first Contemporary African Art Fair. Coinciding with the Frieze Art Fair, its Moroccan founder Touria El Glaoui believes that "given the right platform, there is no reason not to see the same rise in interest we have recently witnessed in the Asian art market." And so, as my mother decided I’d had quite enough oxygen, thank you very much, I was left with one last thought. How is it, that in the span of my little sister’s lifetime (please excuse her selfie) that the international art market has opened up so drastically? While sub-Saharan African artists are successfully taking up UK residencies and exhibiting here in London, three of my good friends are half way around the world in Mumbai sculpting figures for the Dandi March Memorial? Ironically, a memorial that commemorates the 240-mile march of 1930 led by Gandhi, from Sabarmati Ashram to Dandi, in protest against the British taxation on salt. I’d like to think that British sculptor Gavin Fulcher’s pride in creating a work that "signifies the eternal struggle of people against injustice" might one day be translated to the perception that all artwork is unique, rather than the production of our colonial past. 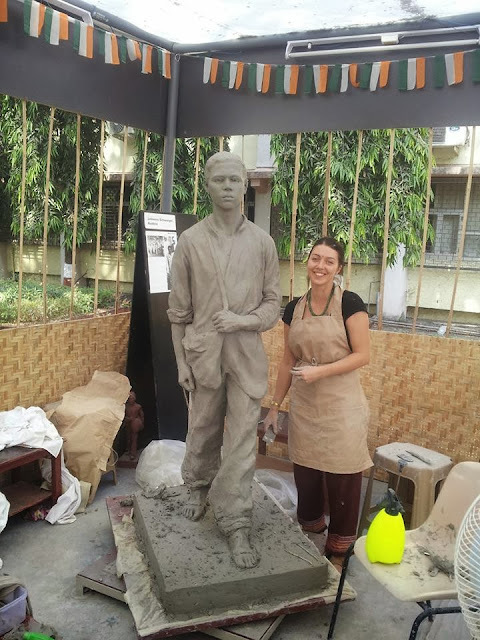 Johanna Schwaiger is pictured here with her one of her two figures for the Dandi March Memorial at the IIT Centre, Mumbai.